soon two more teams are going to be included in Indian premier league. Different rich business group owners also wants to get IPL teams. 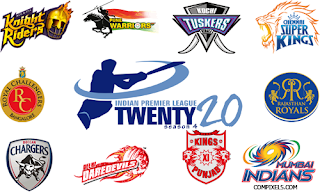 till now there are 8 IPL teams. after 2 more teams will be added the total no. will become 10.
it means in 2011 4th session of IPL 10 teams will play. according to news Hero Honda, Sahara and some other groups are interested in buying IPL teams. T20 cricket is becoming more and more popular everyday.